This is one of our favorite recipes and I was so surprised the first time I made it because Mr. Tastebuds really enjoyed it! You can whip this up before going to work, let it sit in the refrigerator all day and then dinner can be ready in about 20 minutes. See quick, easy, uniquely delicious and so summer yet it tastes fabulous during the long winter months too! Put all ingredients in a large Ziploc bag and put it in the refrigerator to marinate for at least 4-5 hours, longer is better. A half hour before you want to serve dinner, remove chicken breasts and discard the marinate. Grill for 20 minutes turning once. Garnish with slices of lemon. Note: Although fresh tarragon is one of my all time favorite flavors it is a strong, overpowering herb so be careful with how much you add. Side Note: I am posting this recipe for my beautiful niece, Joelle, who is in cook-off with one of her neighbors. The Lavender Chicken is a sure winner...GO GET 'em girl!!! My Lavender Chicken is my entry in the July Monthly Mingle Grill It blog event hosted by Sig of Live to Eat. Your chicken sounds so good! I've must seed some lavender up! Lavender blossoms aren't so readily available but I do have lavender oil - I wonder if that would work. Hmmmm....is the lavender oil food grade? If so it would probably work but I'm not sure how much to use. You can substitute Herbs de Provence too which contains lavender blossoms. This sounds fabulous. I saw your post, then bought a bunch of lavender blossoms at the farmers market this morning. I can't wait to try your recipe later this evening. Thanks for the great idea! Wow, what an exotic recipe... I can imagine the taste.. Gotta get me some lavender blossoms. 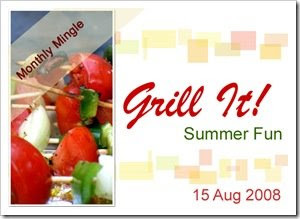 Thank you for sending this to MM-Grill It event! I would never have paired chicken and lavender together - sounds pretty fantastic. Thanks for joining the MM this month!